Ever since we were in Thailand 6 years ago, I’ve been in LOVE with Thai food…it’s all about fresh ingredients and loads of flavor. 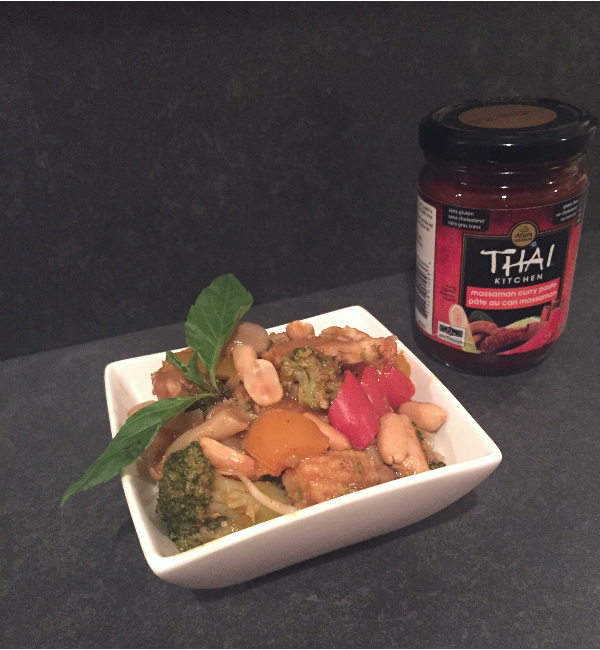 I was super excited when Thai Kitchen asked me to try out their new Massaman Curry Paste. 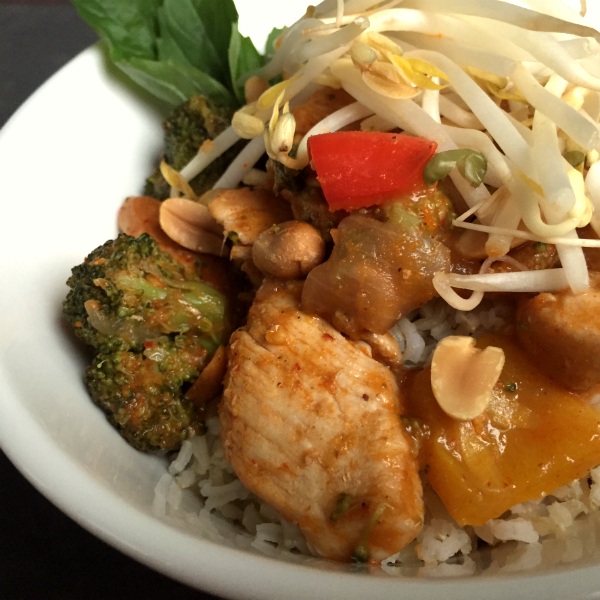 As a kid, I strongly disliked anything with curry, but Thai curries are totally different. I knew that I had to get my friends at Vi-La Palace, a Vietnamese restaurant that we frequent a least once a week, to give me a few tips on the best way to use this curry paste. Vietnam borders Thailand on the east, so they share many similarities in the cuisines. Papa Ken at Vi-La was so amazing and offered to whip up a dish for us to try! I had already started eating the dinner I had ordered, but when the chicken massaman curry came to the table, Jason and I polished it off. I have attempted to replicated Vi-La’s super yummy dish, which was a very close take to the recipe included with the Thai Kitchen Massaman Curry Paste. It’s quick and easy to make and good for you too! 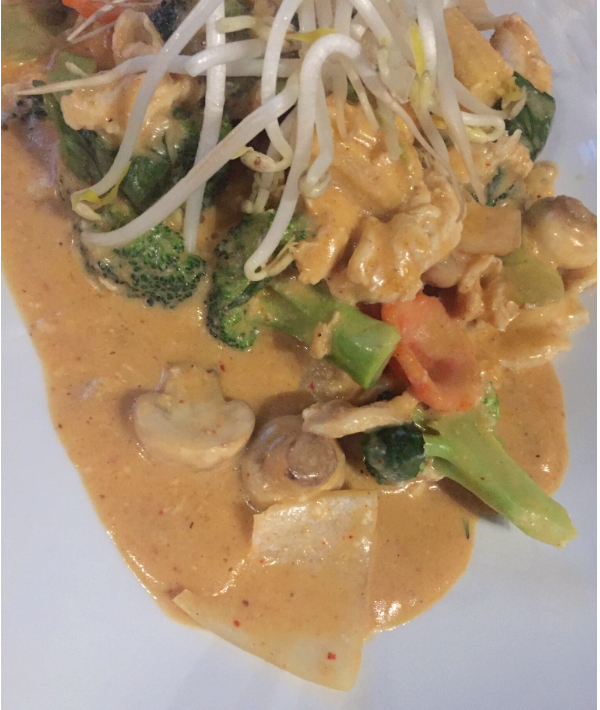 Massaman curry has been referred to by CNN as one of the best foods in the world probably because it is mild and not too spicy, it is salty and sweet, and it is packed with flavor! The sweetness makes it pair perfectly with Thai Kitchen’s Coconut Milk…and I really love coconut! Slice chicken breasts or fillets thinly. 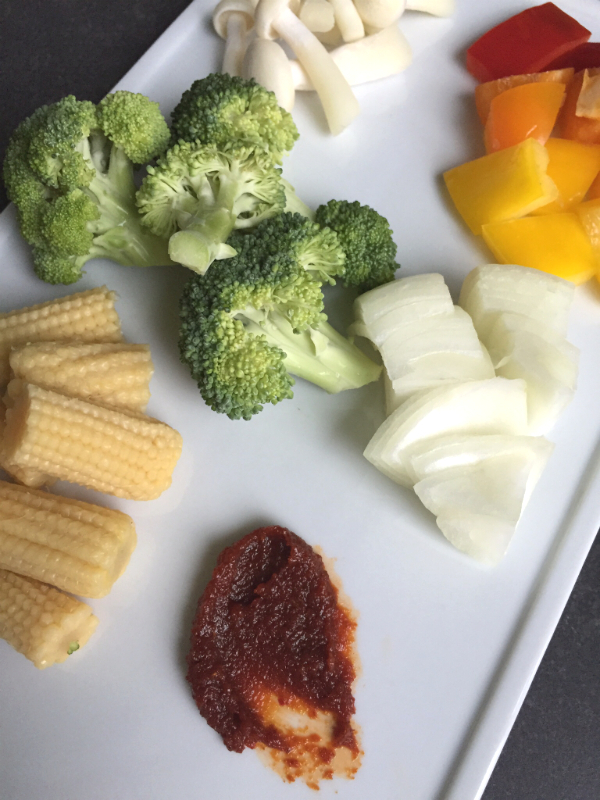 Chop onion, peppers, broccoli and mini corn into about 1 inch pieces. Heat sesame oil in wok or frying pan on high heat. Add chicken and salt and saute until opaque. Add onion and salt and saute about 2 minutes. Add the rest of the veggies and saute about 5 minutes until the broccoli turns bright green. Stir in the Massaman Curry Paste. Add the coconut milk and fish sauce. Add the crushed chilies if desired. Stir together and simmer for 15 minutes to let the sauce thicken. Dissolve cornstarch in water and add to sauce. Stir and simmer another 5 minutes. Serve over cooked rice or rice vermicelli. 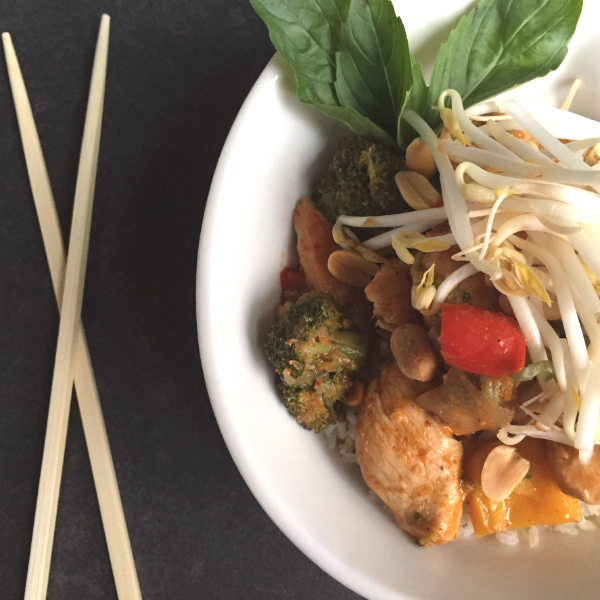 Garnish with bean sprouts, Thai basil (or regular basil) and peanuts. Jason and I like a bit of spice, so that’s why I added the crushed chilies, but just leave them out if you prefer less heat. Also, if you are watching your carbs, you can serve this dish over bean sprouts instead of rice. And try substituting beef or prawns for the chicken. The fam loved the chicken massaman curry. 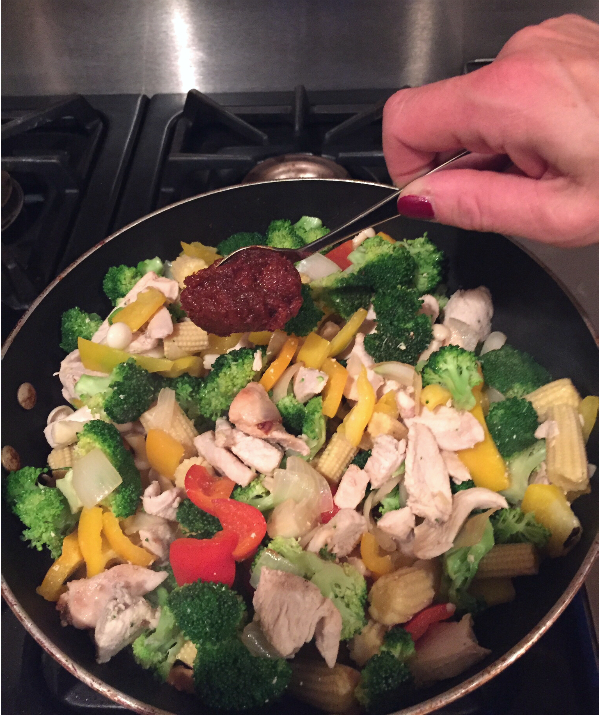 I served it with whole grain basmati rice, so they got a good serving of healthy carbs, loads of veggies and protein! A perfectly well-rounded meal. This will be a regular on our weekly dinner table. This post has been sponsored by Thai Kitchen. I love the flavors in this dish and had fun developing the recipe and hope you will enjoy it too. The opinions expressed herein are the opinions of Sugar Plum Sisters and are not indicative of the opinions or positions of Thai Kitchen.